I bought some bananas on Sunday and by Monday some of them were over ripe. Its the heat ! Over ripe bananas and muffins, cake, bread is all I can think of. Initially, I just wanted to peel the bananas and freeze them for future use. The idea of the hot oven heating up the kitchen wasn’t too appealing. However temptation of baking was greater than the feeling of avoiding the heat. This is one of the first breads I had learnt how to bake when I was barely 21. I got the recipe from my mother in law’s friend. I tried it the first time and it was a hit. After that have baked it so many times. I have served it with tea or coffee, with hot custard and also vanilla ice cream. I baked this bread after a very long time. I forgot how spongy and soft cakes and breads turn out when you actually need to cream the butter and sugar and then add eggs and last of all the flour. The texture is different from that of muffins. I am wondering whether I am going to complete this post today or not??? The new series Everest has begun on Star Plus and today they are screening the second episode. Its different from the other series. Conquering fear, proving one’s worth and fighting fear. Very interesting and hope it stays that way. Many series start of with a bang and then somewhere along the line, fizzle out, become monotonous and forget the message that they initially wanted to convey to the audience. I am back, second episode over and will have to wait till tomorrow for the third episode.Here is the recipe for the simple but delicious banana walnut bread. Preheat the oven to 180°C. Grease and dust a loaf tin. Sieve flour, salt and soda bicarbonate together. Peel the bananas. Mash them. In another bowl add butter and sugar. Cream the mixture till it is soft and creamy. Add the eggs and beat the mixture. If the mixture begins to curdle, add a tablespoon of flour. Add the banana puree and milk. Mix it well. Fold in the flour. Mix gently till all the flour is incorporated into the mixture. Add the walnuts and mix into the batter. Put it in the oven to bake for 35 – 45 minutes until the top is golden brown. Insert a sharp knife or toothpick into the middle of the loaf . If it comes out clean, the bread is done. Remove the bread from the oven. Run a spatula along the side of the cake gently to loosen it. Remove the cake onto a wire rack to cool. Serve once it cools down. Make sure all your ingredients are room temperature for a nice spongy bread or cake. Don’t over mix the batter once you add the flour. This makes the bread or cake heavy and tough. Roast the walnuts lightly before chopping them to get that really nutty taste. Sieving the flour makes it light and airy. It also helps to mix the baking agent well into the flour. If after 45 minutes the loaf is raw from the instead but golden brown on the outside just lower the temperature till its done. To remove a cake or bread from the pan, loosen it away from the sides with a spatula. Place the wire rack over the tin or pan. Hold the wire rack and edges of the tin or pan with a cloth or oven gloves. Turn it upside down and gently place it on the worktop. Lift the pan or tin gently. You can line the tin with parchment paper if you prefer. 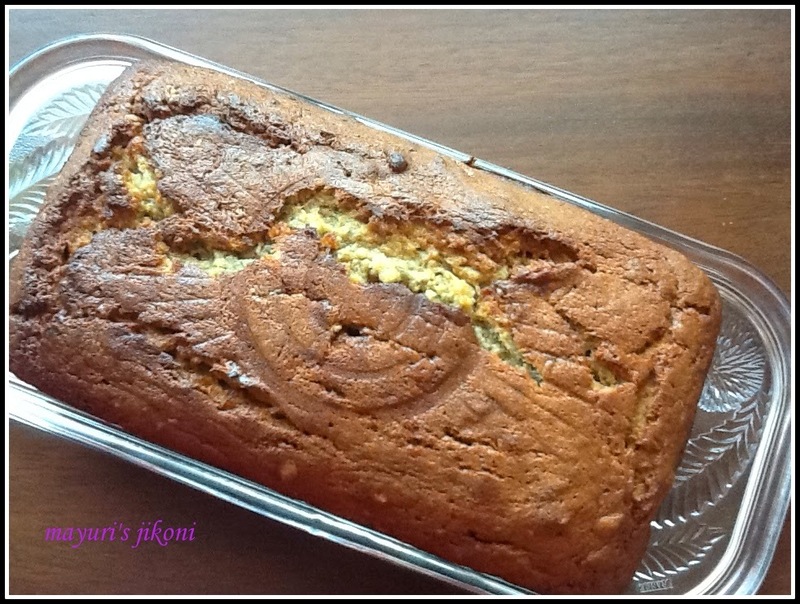 Delicious banana bread Mayuri, My favorite love it.